Carte de Visite of a woman identiied on the reverse as Elizabeth O. Wilbur of Ellsworth, Maine; the photograph was taken by the studio of D. N. Moore of Ellsworth, Maine. The CDV was presumably produced in the early 1870s before Elizabeth married dentist Theodore Augustus Wadsworth of New York. Her marriage was noted in Ellsworth, Maine, records as occurring at Brooklyn, New York, on 5 June 1875, presumably because her address was given as Eastbrook, Maine, which is near Ellsworth, also in Hancock County. 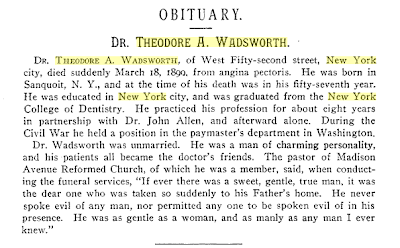 Theodore Augustus Wadsworth, D.D.S., who was living in New York City at the time of his marriage to Elizabeth/Lizzie O. Wilbur, was the son of Rev. Edward Larkins Wadsworth and his first wife Charlotte (Clarke, I think) Wadsworth. Theodore was born 1 May 1841 at Homer, New York, where I presume his father was pastoring at the time. 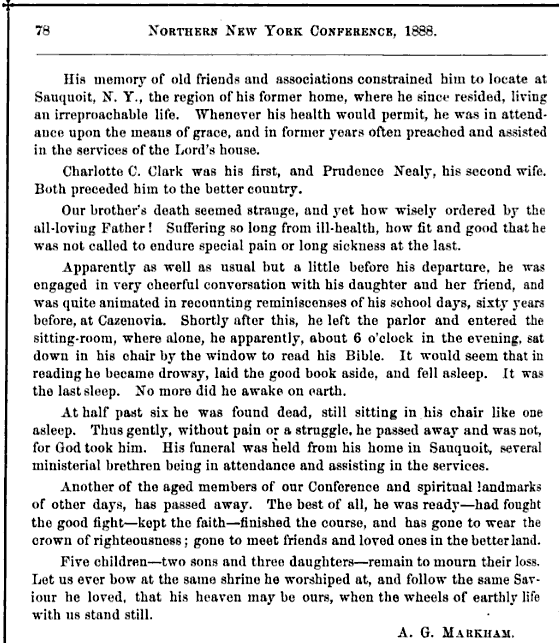 Obituary of Dr. Edward Larkins Wadsworth, from the Minutes of the Methodist Episcopal Conferences, Northern New York, published in 1884. 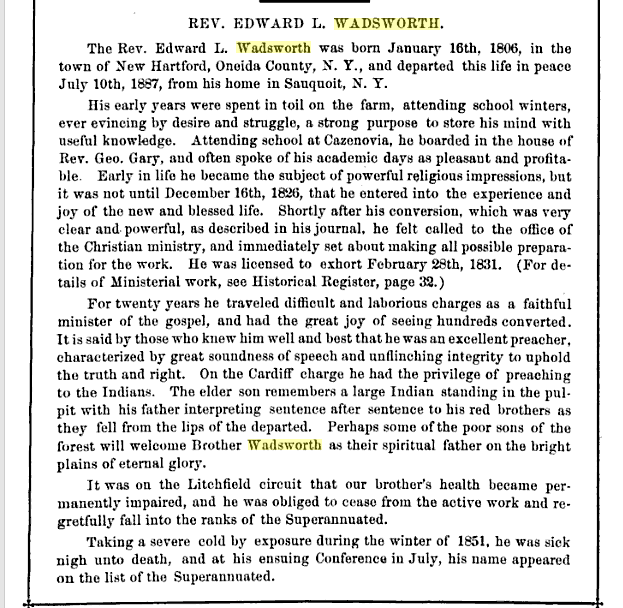 By the time of the 1870 Census, Theodore A. Wadsworth, then a dentist, a graduate of the New York College of Dentistry, was living in the household of his older brother Edward Clifford Wadsworth, also a dentist, and family at Brooklyn, New York. Perhaps Elizabeth was also living at or visiting Brooklyn at that time, and that is how she and Theodore met. I've been unable to identify Elizabeth/Lizzie as to her parents or actual maiden name, if not Wilbur, but it was interesting to note that on the 1880 Census of New York City, she gave Boston, Massachusetts, as the place of her birth, and the place of birth of both of her parents. 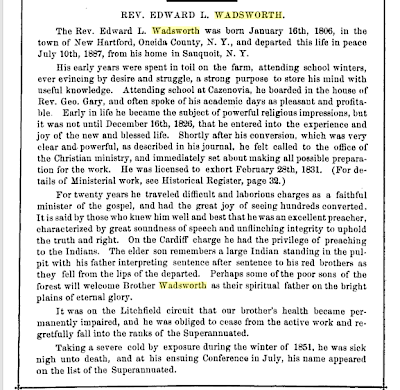 This is an intriguing case as both Wilbur and Wadsworth are surnames that occur in Maine, and I would love to know how Eastbrook, Maine, and Ellsworth, Maine, tie in. Hopefully a reader will have information that will untangle this mystery. 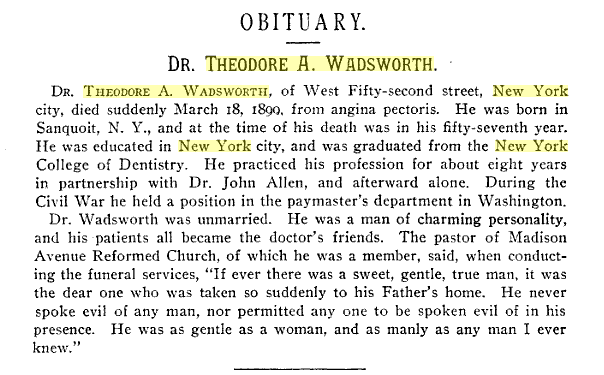 Interestingly, I found an obituary for a dentist named Theodore A. Wadsworth, who died suddenly 18 March 1890 from angina pectoris. 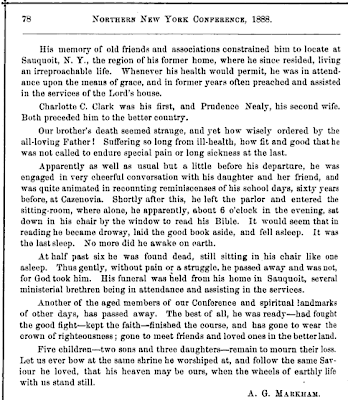 He was described in glowing terms, but the fact that he was described as unmarried makes me wonder if this was an uncle or cousin or if Lizzie had predeceased him or left him, or he her, many years before. Or perhaps I've been chasing the wrong Theodore A. Wadsworth. If you have knowledge of the Wadsworth and Wilbur families of New York, Massachusetts, and Maine, please leave a comment or contact me directly. Thanks!